The click rate, or also the click-through-rate, is a key performance indicator in the online marketing sector to determine success. It can measure both the success of a specific advertising campaign, and also how successful a certain website is. Based on this measuring parameter, you can, for example, find out whether your career site reaches the desired target group in a way that makes them continue to click on the job advertisements.But how can the click rate have a positive impact on the number of applications you get? Let’s assume for a moment that your career site has 4,000 clicks per year and you get 700 applications. When your relevant number of clicks now increases threefold, the behavior is the same for the number of applications. This raises the question of how you can boost your click rate. To increase your click rate, you have to enhance your relevant visibility in the desired target group. Recruitment marketing solves this problem. Recruitment marketing is the process before recruiting. Recruitment marketing’s objective is to convince candidates of your company. 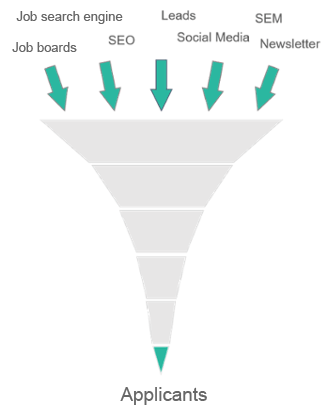 Recruitment marketing’s key task is to optimize the candidate journey. The candidate journey is the path a candidate takes until he sends his job application to a company. It starts with the first contact with you as the company and ends with the application. Find out more about the candidate journey here.